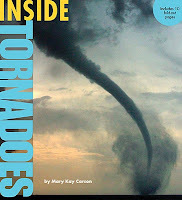 Inside Tornadoes by Mary Kay Carson. (Grades 4-7.) Sterling, October 2010. 48 pages. Review copy provided by publisher. The wind picks up. The clouds darken. The sky takes on a weird greenish hue... A tornado is coming! Do you know what to do? Inside Tornadoes gives kids the inside scoop on these twisty little storms (or twisty BIG storms, rather...) with tons of interesting information and stunning photos that bring the facts to life. Everything a kid would need for a school report is included in this book - information on how and why tornadoes form, the Fujita Scale (did you know that since 2007 they are using the Enhanced Fujita Scale, correcting for over-rated wind speeds in the most dangerous tornadoes? ), maps of where tornadoes have most often occurred, diagrams of how the storms move, and lots more. So, sure, this would be a great choice for a report. But Carson also includes very readable accounts of four of the strongest tornado systems in history. One thing I love is that she includes "I Was There!" sections for each of the four, giving a survivor's account of what it was like to go through the storm. And the photos... They really add to the text and give kids a good picture of what's going on. Photos of many different types of tornadoes are included in the "Twister Gallery". Can you tell a rope tornado from a stovepipe tornado? Do you know what motions an elephant trunk tornado makes as it moves? Many of the pages with photos and diagrams fold out or up to pack an even bigger punch. One of my favorite spreads features aerial photos of city blocks in Greensburg, Kansas before and after a 2007 tornado, showing just how much destruction a tornado can bring about. Inside Tornadoes is part of Sterling's Inside Series, which right now include Inside Hurricanes, Inside Dinosaurs, and Inside Human Body. It looks like several additions to the series are slated for next summer, including Inside Stars and Inside Volcanoes. This'll definitely be a series you'll want to add to your library shelves. And hey hey, it's Nonfiction Monday!! Head on over to MotherReader for this week's roundup!